I slept like a brick last night! I love this blanket. Perfect weight and oh soo soft! will buy more very soon. The Aqua color is beautiful! You won't need more than one blanket to stay warm when you cozy up with this weighted mink blanket from Windsor Home. Incredibly soft and plush, this heavy faux fur blanket is perfect for those cold winter nights. These are fabulous blankets. We bought these for our kids and they are like new. Thrilled to find these for our grandkids. They are heavier than normal blankets but Soft and warm but also cool. If you need a good blanket that will last years and keep you warm and cozy, this is it! Wash well Color doesn't run. I had purchased the "Elegant Comfort Super Soft Heavy Weight Stripe Micro Sherpa Blanket" for me, which I am truly disappointed in that blanket! It is soft, but not heavy at all. Its crap! However, I purchased a dark gray "Windsor Home Solid Soft Heavy Thick 8lb.Weighted Plush Mink Blanket " for my daughter. I have to say hands down. This blanket is EVERYTHING it claims to be. You get quite the workout tossing this blanket into place on the bed, that's for sure!!! I really wish I would have purchased 2 of these! I may end up sending the other one back and go with one of these for me too!! I absolutely love this blanket and so does my little girl. I don't think she has EVER slept so good in her life!!! 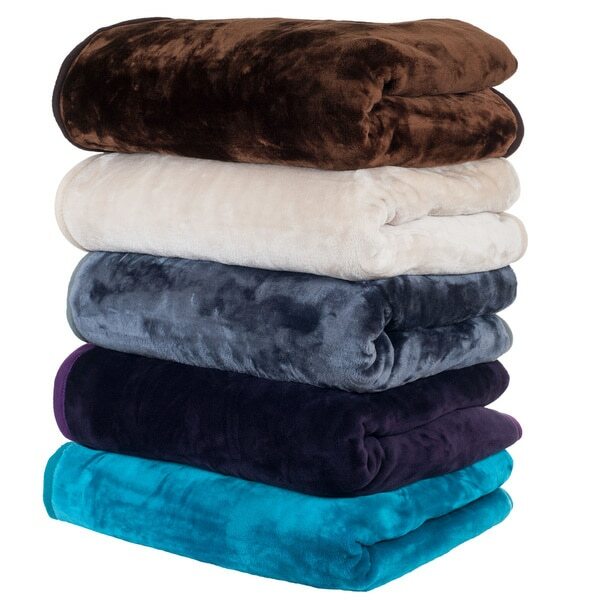 Windsor solid soft heavy thick weighted plush mink blanket. I got the turquoise the color is great! It's very heavy beautifully made I absolutely love it! Beautiful extra thick plush blanket! I won't be needing any extra layers of blankets, quilts or bedspreads with this in the winter. This is a Thick, Rich, Cozy blanket that is going to last many years to come. It reminds me of the Mink blankets we had in Germany and in New York during our brutal winters. Great for cuddling around the fireplace or take along for those outdoor events where long johns just don't cut it.I highly recommend this blanket for those cold days and nights when no lightweight bedding will do! Washed in cold water, spin cycle x2 and partially dried on low till damp then hung to finish drying on the(folding/portable) clothes dryers. Warm, warm, warm. Best selection of winter blankets but would like to see more colors. The description for this blanket is precise. It is a very solid, soft, heavy, thick, plush blanket. And I love it. It looks and feels very expensive. And I have had no problems with shedding. But if you intend on purchasing this as a winter blanket... do not. Although very lush and comforting, this blanket does not retain heat. I was very disappointed at this. I would not discourage anyone from purchasing it because it is so soft and cuddly but I would recommend another blanket on top of it to stay warm for the winter. This can be used for spring, summer and fall but must be coupled with a winter blanket or comforter for the winter. In fact I use it as a "bed sheet" to lie on sometimes. This thick plush mink blanket from Windsor is absolutely EXCLLENT! I highly recommend it for yourself or as a gift. It is so soft and cozy, especially keeps you warm in this cold winter weather. The purple color is a deep rich purple and looks royal. Enjoy. Excellent plush mink blanket. It weighs 8 pounds so it will definitely keep you warm. Luxury. Beauty. Coziness of a child tucked in by a loving mother. I really cannot say enough about this sheared faux mink blanket. I fot the turquoise one. My bedroom decor has shades of crimson, gold, and rich turquoise. I couldn't believe my eyes when it arrived. The color was true to the advertisement. Except, and it's a big exception, the sheared pile seems to shimmer and flow in varying shades of this lovely turquoise blanket. I love that it is weighted. Unlike the newer lightweight fleece blankets that you cannot even feel upon you, this blanket hugs and tucks around your body, just as the woolen blankets did when I was a child (70+ years ago). Between this beautiful blanket, my new microfiber 1800 thread sheets, and the soft down fill pillows (all purchased at Overstock), I am sleeping like a baby. Really. Treat yourself to some beauty and luxury. Overstock offers so much at reasonable prices. I wish you lovely sleeping and sweet dreams. This is a great blanket if you are looking for one to keep you warm and cozy. It's nice and thick and very soft. It's the warmest blanket I own and I have bought many looking for one this warm. The blanket came within the given time frame. It is a bit $$$$, but use your coupons and it is not so bad. You won’t regret getting this blanket it is nice and heavy and keeps you toasty and warm. I definitely recommend this blanket for anyone. I have a blanket from Korea and it is very soft and cushy. This one has shorter pile and not as soft. Love the softness, comfort and thickness of this blanket. This is a large blanket and fits nicely on a full or queen bed. The weight is great for kids but also as a regular blanket for adults. My kids loved their blankets. I love that it's thick and so soft and warm. Love the heaviness of the blanket! It is soft and a pretty large size. Was a little disappointed because there was a stain on it when I received it, but overall it was a good buy! I bought this blanket for my son, and he loves it. It is VERY heavy for a plush blanket, which is wonderful in the winter. The color is more green than it appears in the picture, which I rather like. The edges are rounded over and stitched very well He's used it for several months now with no pilling or shedding, I just hang it on my clothesline to dry after washing with no problems. I highly recommend this blanket. My husband absolutely loves this weighted blanket. "It says in the specs, comes in full, queen, and king, why cant it be ordered in sizes?" I apologize for the confusion, this blanket is only available in one size (81 inches x 91 inches). "Does this fit a full or queen size bed or is it a throw?" This is a blanket. The size of a queen bed is 60” wide x 80”. The blanket is 81” wide x 91” long. "Can't order this without a size selection." Hello Pamela L., this blanket is approximately 81 inches x 91 inches. Unfortunately, it is not available in different sizes. Sorry for the inconvenience. Thank you for shopping with us! "All all sizes the same price? I need a twin..."
Hello elaineinin, we are still researching this and should have the answer shortly. "Please indicate where we are supposed to pick our SIZE OUT!... I need a King size, and would like you to go ahead and ship only one of this size if you have one please, in this color brown "Soft Heavy Thick Plush", charging my Overstock Card. 81" X 91" is not a king size." Hello Kitty, the size is approximately 81 inches x 91 inches, this is currently the only size we have available. Thanks for shopping with us! I'm very easy to get cold so I love heavy warm blankets. I'm also looking for a blanket that's made of 100% nylon with insulation made like sponge or foam on the inside. If you have this blanket please let me know! Have a similar one that we got years ago. It is the warmest blanket I've ever had and I love it!!! But it's only a full size and we have wanted a larger one for so long. Glad I found this one - so excited! !